She added that a lot of Kuwaiti women have been killed because of article 153. According to this article of Kuwait’s penal code, if a man catches a female member of his family in an unsavory sexual act with a man and kills her or him or both, the crime will be treated as a misdemeanor punishable by a maximum of three years jail time and/or a fine. According to a recent study conducted by the Campaign to Abolish Article 153 in 2018, it was found that 51.2 percent of Kuwaiti men and women are affected by violence. In another earlier study carried out by the OrangeQ8 campaign in early 2017, 60.8 percent of Kuwaitis and non-Kuwaitis have suffered from life-threatening violence. “The campaign is about women and their families, men included. Controlling violence and trying to help people who are victims of violence is our duty. Living without violence is not just a woman’s right, it’s the right of humanity,” Soroptimist President Dr Amar Behbehani said. Behbehani noted that statistics show women’s security and personal safety on the national level in Kuwait. “Our Soroptimist Kuwait project is a local campaign corresponding with the United Nations Orange the World event. 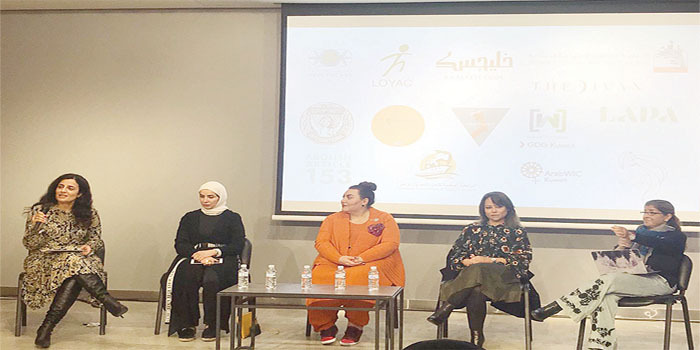 It is a local NGO that is a branch of Soroptimist International, a global volunteer movement striving to improve the lives of women and girls, comprised of around 50 remarkable Kuwaiti and expatriate professionals and businesswomen,” Behbehani said. Soroptimist Kuwait focuses on action and awareness in five areas: Economic empowerment, education, environment, food security and health, and ending violence against women. Soroptimist Kuwait joins the global efforts of Soroptimist International and the United Nations to eliminate violence against women and girls, and support women to speak up and take a stand against violence. Lawyer Azraa Al-Rifai pointed out that the provision of shelter and other services is a key part of Kuwait’s commitment to protecting victims of violence and ensuring women’s right to security, safety and human dignity “We call on the Ministry of Social Affairs to work urgently to operate shelters to protect women in Kuwait who are suffering from violence,” she said. “There should be a hotline for cases to investigate and provide protection within their families. The shelter is temporary – to qualify the women psychologically and provide them appropriate work to rely on themselves. This is what we need in Kuwait – we do not need a hotel accommodation where women sit without rehabilitation, but centers to reengage them in society,” she added. Malak Jassim Al-Rasheed, Professor of Social Work at Kuwait University, said that the vision is to envision a future in which all women in Kuwait are free from physical, emotional and economic abuse. “I am presenting the governmental part, where I am a member of the Supreme Council for Family Affairs and head of the team that is in charge of the establishment of shelters,” she said. “We need every girl and woman to believe that she has the full right to a safe life. There are a lot of cases and families that refuse to retake their daughters fleeing violence by their husbands and force them to return to their husbands, broken and humiliated. Creating a shelter for these women is the best solution to ensure their rights in Kuwait,” she added. Rasheed explained that Kuwait was the first country to sign in the UN Committee on the Elimination of Discrimination Against Women (CEDAW) agreement, but the applying for creating a shelter is taking a while. “Better late than never. Kuwait now is implementing a full strategy to create the shelter.” The event discussed the challenges and opportunities to promote effective change for women in Kuwait, legal actions against violence, women’s physical and mental health, education and its role in empowering women and real stories of resilient women.